These oven roasted Brussels sprouts are lightly seasoned with garlic and parmesan, resulting in a winning flavor combination the whole family will love! Fresh, crunchy and so easy to make, this Brussels sprouts side dish is a winner! 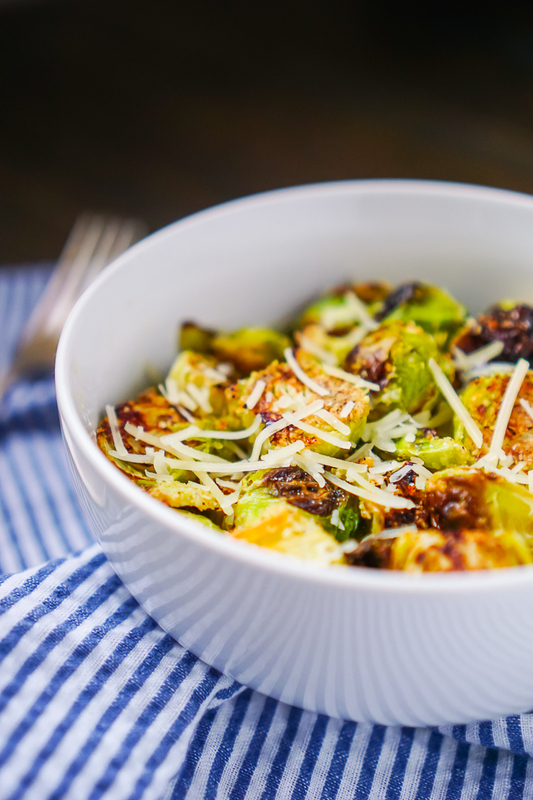 Pan Roasted Brussels Sprouts with Parmesan and Garlic are a huge crowd pleaser! 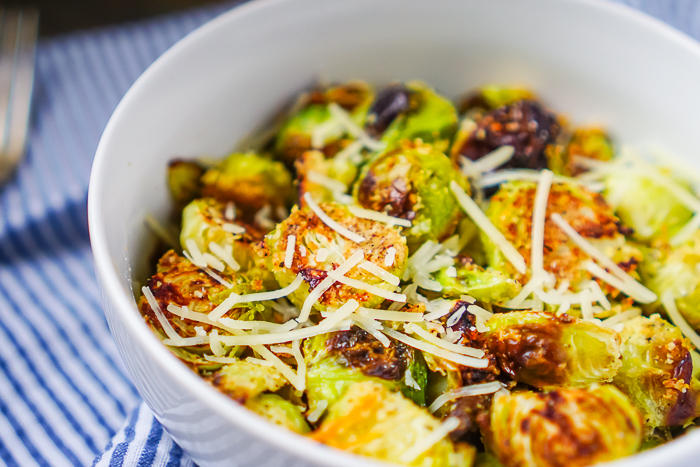 We all loved these Garlic Parmesan Pan Roasted Brussels Sprouts, including Bryan! I personally think oven roasted brussels sprouts is the best way to prepare the vegetable with grilling them coming in second. However, he did also like my Cranberry Apple Brussels Sprouts Salad which is a downright miracle in our household!! My sister and I wanted a new vegetable at Thanksgiving this year, which is where this recipe comes from. We knew some of our family were Brussels sprouts converts, but we weren’t sure how many or how adventurous they were. I figured you can’t go wrong with preparing Brussels sprouts with parmesan and garlic – two of the most universally loved ingredients. Oven roasting Brussels sprouts is such an easy process with less than 10 minutes of prep before you put the pan in your oven and let it do the rest of the work for you. It has become one of my go to side dishes for a weeknight dinner, so it’s not uncommon to bind a bunch in my fridge! I also love these as a holiday meal because you can quickly prep these the day before or the morning of. To prep ahead of time, I just trimmed and cut the Brussels sprouts and tossed them in a Ziploc bag with the other ingredients, letting them sit until I was ready to throw them on the prepped pan and toss in the oven. Easy peasy! With a sharp, chef knife, trim off the bottom of the core. About 1/4″. Remove tough, loose leaves and discard. Cut the Brussels sprout in half (vertically, cutting right through the core) or quarters. I like to have mine close in size to cook evenly so I will half smaller Brussels sprouts and quarter larger ones. TIP: If you don’t like core in your Brussels sprouts, I recommend getting this core removal tool! It easily removes the core from the Brussels sprouts. Just use it as step 1! CUT THEM: Making sure to halve or quarter them will give you a good searing surface and the nice roasted crunch you want! Make sure to put the cut side down on the pan. HIGHER TEMPERATURE: I like to roast my Brussels sprouts between 425 F and 450 F because it gives me the crispy leaves and slight charring on the sprouts. DON’T CROWD THEM: Brussels sprouts naturally have a lot of water in them, so you do not want to over crowd the pan. That will result in more steamed Brussels sprouts than roasted. With a temperature between 425 F and 450 F, I recommend roasting Brussels sprouts between 20 and 30 minutes. Keep an eye on them as size and oven can vary cooking. You’re Going to Love These Oven Roasted Brussels Sprouts! 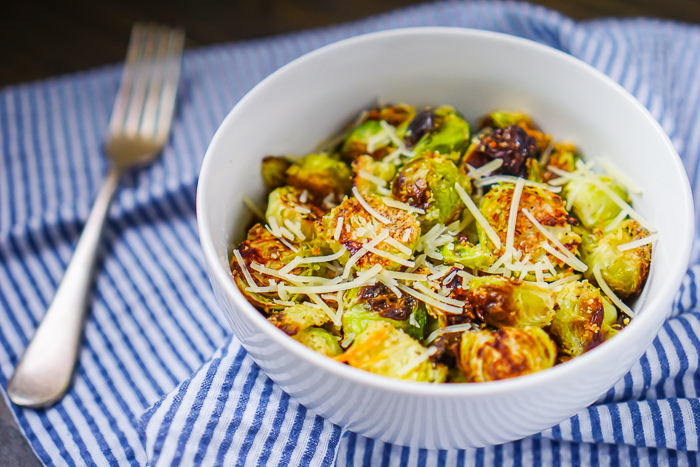 Combine Brussels sprouts, olive oil, grated parmesan, garlic powder, salt and pepper in a large bowl or ziploc bag. Seal and toss until coated evenly. Place the Brussels sprouts onto a large baking sheet with the cut-side-down touching the pan. Bake at 425 F for 20-30 minutes or until the Brussels sprouts are lightly crispy and charred on the outside and toasted golden on the bottoms. Some of the loose outer leaves will be extra dark and crispy but they are still good! Taste and sprinkle with extra garlic powder, salt or pepper if necessary. Sprinkle shredded parmesan on top and serve!